Imagine if you never forgot anything, not a single moment from your past, how would your brain feel? For Bob, one of the many special “characters" Helen Thomson profiles in her riveting new book Unthinkable, such a state of being is an everyday truth. The 64-year-old suffers from Highly Superior Autobiographical Memory, a condition that allows him to remember every day of his life with vivid clarity (about 50 people in the world are known to have this remarkable ability at the moment). Bob’s earliest recollection is from the time when he was nine months old. When asked to go back to any random date decades ago, he takes seconds to recount what he did hour by hour on that day. His case history brings to mind the plot of the movie Eternal Sunshine Of The Spotless Mind (2004), in which an estranged couple struggle to erase memories of their relationship, lose their way in the labyrinth of their minds, and end up with each other, again and again. Oddly, forgetting could often be the toughest challenge for the human brain. To read Thomson is to be confronted with the myriad surprises that the mysterious organ, with the texture of a “shiny pannacotta" (as she describes it), holds. As the subtitle promises, Unthinkable takes us on “An Extraordinary Journey Through the World’s Strangest Brains". We meet a woman who is “permanently lost" because her internal GPS—the biological compass that orients us to our immediate surroundings—is damaged. Sharon has had to pass up jobs because the office building was located along a curved road, which she is unable to get around, or had too many winding passages, where she would inevitably lose her way. The only way she can find her bearing is by performing a spinning trick, “like Wonder Woman", as she tells Thomson. Then there is Rubén Díaz Caviedes, who is colour-blind but intensely synaesthetic, a state of being that bestows on him heightened awareness, enabling him to see auras around people and objects. The colour red, for instance, around a person signals attraction for him. Thomson’s day-long encounter with Caviedes, and her glimpse into the reality he inhabits 24x7, leads her to the most profound question in her research: “Does my world look like yours?" This, in turn, becomes the frame through which her book should be read. Combining her extensive reportage (Thomson is happy to fly halfway across the world for a worthy story) with keen scientific knowledge (she was trained as a neuroscientist before she chose journalism), Thomson succeeds in holding our attention. While there are some sensational chapters, one on lycanthropy for instance (where the patient has the delusion of turning into an animal, usually a wolf), she never gets carried away by the dramatic potential of a case. Her meeting with Matar in the United Arab Emirates, who believes he is a tiger, is charged as much with horror as pathos and, most crucially, with a clinical curiosity about his condition. Thomson’s investigation traces Matar’s history, as she does with all her subjects, back to his complicated past, by linking physiology, psychology, psychiatry and neuroscience into a complex matrix of meaning. Yet, in her urge to get to the bottom of a case, Thomson never relinquishes a healthy sense of doubt about everything she learns and observes. Her witnessing of Cotard’s syndrome in a man—an extreme form of depersonalization where the patient wakes up convinced he is dead—leaves her feeling uncertain, before she begins to trust his claim. 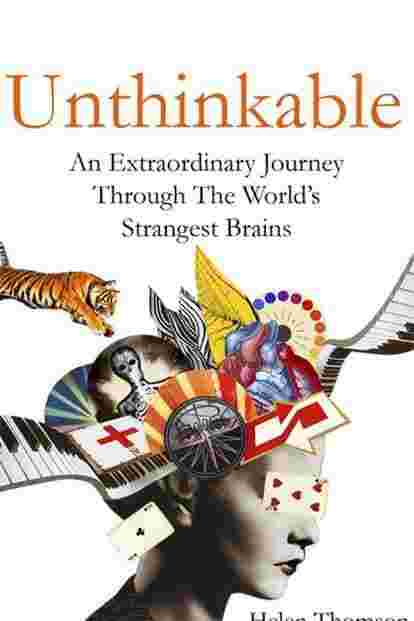 Unthinkable—An Extraordinary Journey Through The World’s Strangest Brains: By Helen Thomson, Hachette, 336 pages, Rs399. Similarly, meeting Joel Salinas, whose affliction is to experience too much empathy as his brain mirrors the sensations felt by the people around him, leaves Thomson mystified. As a physician by profession, this singular ability puts Salinas in a double bind. He is able to understand, by virtue of his power of empathy, the exact symptoms described by his patients, down to the last painful detail. But this peculiar gift can also become a curse, which makes him vulnerable to feeling every prick of the needle on another person’s skin on his own body. In extreme cases, he feels his own breath will also stop with that of a dying patient’s in front of him, and has to remind himself to control its rhythm. “Mirror neurons make us all alike," Thomson quotes neuroscientist V.S. Ramachandran as saying. “They’re acting in the same way whether you or I make the action. If you remove my skin, I dissolve into you." As we read the stories of the nine incredible brains documented by Thomson, this sentiment begins to ring truer than ever.